Mary was among the women who were present at the crucifixion of Jesus whenhis male disciples, save for John, abandoned him. Most Christian traditions assume that Mary was from the place called Magdala near Tiberias on the shore of the Sea of Galilee, where Jesus landed (Mt 15:39, cp. Mk 8:10), even though there is no information to indicate whether this was her home, her birthplace, or whether she had some other connection with the place. Patrick Duffy tells her story. Mary Magdalene is first mentioned in Luke’s gospel as one of the group of women disciples of Jesus, “who provided for them out of their resources” and she is the one “from whom seven demons hadgone out” (Luke 8:2-3). She is also among the women who were present at the crucifixion of Jesus when the male disciples, with the exception of John, abandoned him. She stood with his mother Mary “near the cross” (Jn 19:25), “watching from a distance” (Mk 15:40) and saw the tomb and how his body was laid (Mk 15:47; Lk 23:55; Mt 27:61). She is among the women who very early in the morning on the first day of the week went with spices to the tomb to anoint the body (Mk 16:2+; Mt 28:1+), but found the tomb empty. She went to tell Simon and the other disciple, the one Jesus loved (Jn 20:1-2). She is the first to whom Jesus shows himself after the resurrection, though at first she doesn’t recognise him till he called her name, Mary. 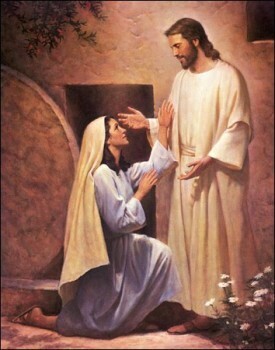 Then she cried ‘Rabbuni.’ He said “Do not cling to me, for I have not ascended to my Father. but go and find the brothers and tell them: I am ascending to my Father and your Father, to my God and your God” (Jn 20:11-18). 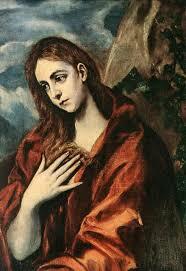 For the first five centuries Mary Magdalene is highly regarded. Ambrose and Augustine both associate her with the New Eve who faithfully clings to Christ the new Adam, reversing the sin of the first Eve. However, at the end of the sixth century an influential sermon of Pope St Gregory the Great (540-604) used the word peccatrix (“a sinful woman“) of Mary Magdalene. He also wrongly identified her with Mary of Bethany, sister of Lazarus and Martha (Jn 12:1-8), on the one hand, and, on the other, with the woman who was a sinner (Lk 7:36-50), both of whom had brought precious oil to anoint the feet of Jesus. Gregory also wrongly identified her with the woman taken in adultery (Jn 8:1-11). These confusions have persisted into the tradition about Mary Magdalene and it’s a short step from peccatrix (sinner) to meretrix (prostitute). Because of this, the complexity of “Marys” in the New Testament became reduced to a simple dualism: Good Mary, the ever virgin mother, and the repentant sinner, Bad Mary. Far from lessening Magdalene’s role in popular devotion, this reduction only served to feed a fascination about her. Artistic depictions fuelled it even more. The tradition in the East was that Magdalene went with the Blessed Virgin and John the Apostle to Ephesus, where she died and was buried. The English bishop Willibald is said to have seen her tomb when he visited there in the 8th century. The town of Vézelay in Burgundy had from the 11th century claimed relics of Mary Magdalene, which, it was said, a monk Baudillon brought from St Maximin-la-Sainte-Baume in Provence. The legend was that she, her brother Lazarus and her sister Martha had all evangelised Provence. The Cluniac Benedictines of Vézelay and the Dominicans of Saint-Maximin for the next few centuries competitively reported miracles in support of their respective claims.